Charred burgers, dry chicken, a brisket my husband once described as “an old boot.” I was never a sizzling success at the grill until I took a “Girls Gone Grilling” course with a friend about 8 years ago . . . and now I actually TEACH classes on how to grill! I’ve grilled nearly everything imaginable, from watermelon to Mahi Mahi to marshmallow banana boats, and love how this ancient cooking method lets me express my creativity in a thoroughly modern and most delicious way. 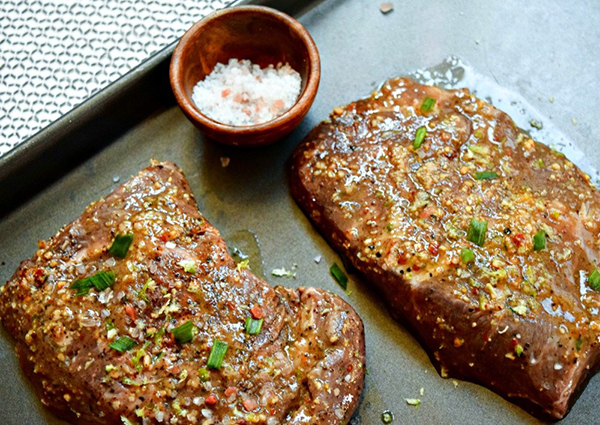 Whether you’re a barbecue newbie or a well-seasoned veteran, my recipe for Mango-Marinated Flat Iron Steaks with Fruity Ginger Jicama Slaw is sure to win you over with tropical island-inspired taste, to-die-for tenderness and a truly vibrant summer vibe! If you’ve never grilled a flat iron steak before, you’re missing out! I’d prefer to keep flat iron my greedy little secret, but I’ll share – this steak, cut by the butcher from a top blade roast, is second only in tenderness to tenderloin yet is so much more economical, typically a third the price per pound! Requiring only a 15 to 30 minute marinade for flavor (or an even quicker dry rub), this increasingly popular cut of beef is a no-fail superstar for the grill thanks to its uniform shape and thickness and rich, succulent taste. These days, my small army of carnivores is often out enjoying the teenage social scene at mealtime, meaning I don’t need to fire up my big pit and grill massive quantities meat. So, when it’s just dinner for two (or four with the neighbors over), my handy Weber Q 1200 fuels the flames (and fun) for my never-ending food adventures. 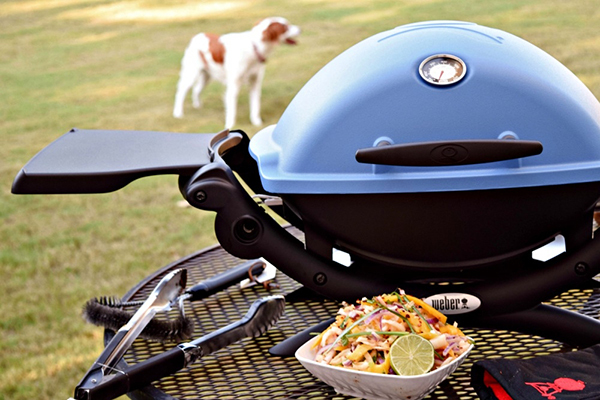 This smaller-scale, yet not at all flimsy, portable grill has also been toted along on camping trips, parties in the park and cooking demonstrations. I have a busy life and don’t like coddling a charcoal grill, so this gas grill is perfect for me with a no-fuss electric ignition and 14-oz. screw-on propane tank. I also appreciate that this small but mighty grill has two generous-sized, fold-down trays to accommodate all my platters, spatulas, bottles of seasonings and such. Oh, and did I mention this Weber grill comes in a rainbow array of seven color choices to match any outdoor décor (or outfit)! It just makes sense to serve a fresh and fruity slaw with this grilled steak recipe – summer is here and all my favorites are at the farmer’s market. Super sweet mango, zingy ginger and crunchy jicama make a tasty team in this summer slaw recipe – it’s perfect for every summer celebration, backyard bash or simple dinner solution. 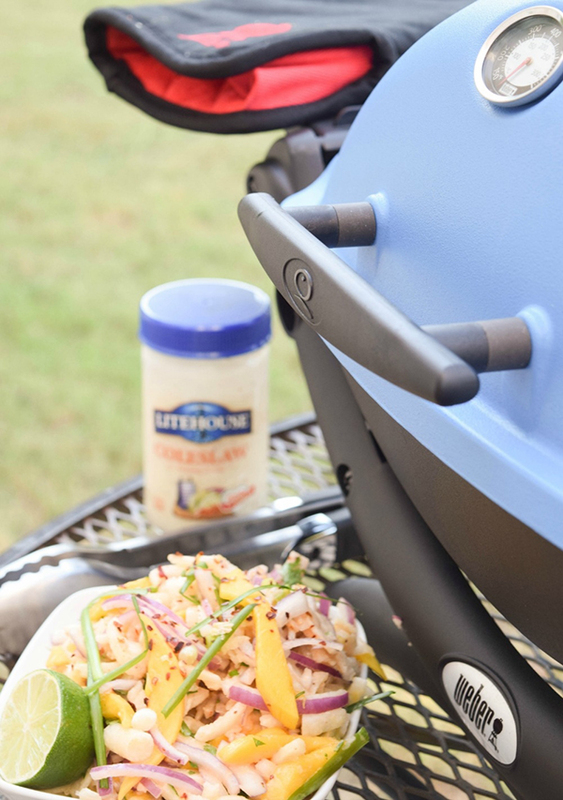 To keep the dressing easy-breezy, it starts with sweet and tangy Coleslaw Dressing from Litehouse as the base. Mango juice, lime, ginger, scallions and a small squirt of hot red pepper sauce are whisked in -- it comes together in the blink of an eye. Using a prepared dressing from the produce department is a simple recipe hack that allows me to spend more time on creating new flavor profiles and less time reinventing the wheel! Leftover Fruity Ginger Jicama Slaw will stay fresh and soggy-free in the fridge for a couple days – you can thank jicama for its long-lasting crunchiness and refusal to oxidize (won’t turn brown quickly like a cut apple). When the flat iron steaks are long gone, feel free to fire up the Weber Q 1200 to grill shrimp kebabs, fish filets or chicken breasts as an alternate serving suggestion. Also, head over to Weber Nation for more tips and tricks to grill the Weber Way! For Marinade and Steaks: Combine mango juice, lime juice, lime zest and olive oil in bowl .Whisk in garlic, chili powder and red pepper flakes.. Pour mixture in zip-top plastic bag and add steak, turning to coat. Let marinate for 30 minutes, turning occasionally. Heat grill to approximately 400 F degrees. Remove steak from marinade; discard marinade. Season steak on both sides with salt, to personal preference. Add steak to grill and grill approximately 5 to 6 minutes, before flipping once to cook another 4 to 5 minutes. For medium-rare, remove steak from grill when instant-read thermometer registers 135F degrees. Allow to rest 5 minutes. For Dressing and Slaw: In large bowl, toss together jicama, red onion, mangos, green onions (cross-wise sliced bulbs and length-wise sliced tops), cilantro and red pepper. Set aside. In small bowl, whisk together Coleslaw Dressing, mango juice, lime juice, lime zest, vinegar, ginger, green onion and sriracha. Pour over slaw and stir gently to evenly coat. Serve cold. Adapted from: Jennifer Fisher. Visit Jennifer at her blog, www.thefitfork.com.